"WaterBoy" well bucket with tripod. I hope it doesn't happen, but I do expect the electric grid to really go down someday. If/when that happens, I won't be surprised if the power is off for weeks, months, or even years. It's not a scenario I'm obsessed with, but I do feel compelled to consider the possibility enough to have a plan in place to keep my family supplied with clean water. For short-duration power outages I have a small generator and a few cans of gasoline. The generator will run the 110 volt submersible pump in my drilled well. For a long-term outage the plan was (and still is) to collect rain water into drums using Steve Lonsky's Amazing Siphon-Tube Rain Barrels (as explained in This Informative Book). I have the barrels and siphon tubes. I also planned to collect buckets of water from the creek behind my house and carry them with a Whizbang Shoulder Yoke (See The Same Book for How-To Plans). I have the buckets and yokes. To filter water for drinking, I have a Big Berkey water filter (do a Google search for Big Berkey). Aside from the short-term fix (a generator), the plans I have to gather water are all very low-tech, which means they are relatively cheap and very dependable. But the fact is, I have a drilled well not far from the door of my house. It is easier to get to than the creek, which is down in a gully. And the well is full of good drinking water that doesn't require any filtering or other treatment. The well is about 80 feet deep and the water level is down about 25 feet. So it has been on my mind for some time to try making a well bucket. There are numerous designs for homemade well buckets on YouTube. But I wasn't impressed with any of them. Then I saw the Heavy Duty WaterBoy Well Bucket that is made and sold by Darren and Linda Holliday, who are located in Missouri. I watched This YouTube video of Darren showing how his well bucket works, and I decided that, instead of making my own well bucket, I would buy one from him. I placed my order back in September. While I was at it, I bought the tripod kit too. The total cost, including shipping, was $216 ($84 of that was for the well bucket). My order arrived in a timely manner and I was impressed. The well bucket is intelligently designed. Darren is obviously a talented "shade tree engineer," meaning he has taken commonly-available parts (made for things other than well bucket components) and put them together to make a product that not only works very well, but looks to me like it will hold up for a lot of heavy use. It's a good feeling to know that I can now fetch good drinking and cooking water out of my well in the event of a crisis. But to be ready for that crisis, I needed to make the tripod. The tripod kit I bought isn't the whole tripod. It is only the top assembly. I needed to purchase three 12' lengths of 1.5" square tubing (1/8" thick). I bought the tubing new from a local welding shop. The cost was $110. To attach the legs to the top assembly I had my youngest son help me drill some holes and bolt the assembly on. It took only a few minutes. I explained to my son why I had bought the bucket and tripod. I told him that I might be dead and gone before the electrical grid crashed, but I wanted him to know about the well bucket and the tripod and hang onto it if something happens to me. If he thought I was being kooky for thinking and planning for the grid to go down, he didn't say so. We tied the tripod up to the rafters of one of my storage sheds. I bought a length of good-quality rope and put it up there too. As for the well bucket, I confess to taking it apart and studying the design for awhile. Then I got to thinking about my neighbors. What good is my family having water if those around us don't have water? Maybe they've got plans of their own. I sure hope so. But the thought entered my mind that I should have half a dozen more well buckets for my neighbors. I identified six strategic locations on the country roads that are near my house—six locations where there are small groups of houses, usually at crossroads. If there were a sturdy well bucket at each of those locations, everyone in a fairly wide radius around me would have access to fresh well water in the event of a long-term grid crisis. When that thought entered my mind, I pondered on it for awhile and came to the conclusion that I should act on it. There is no reason why I shouldn't, except that it would cost me a lot of money to buy six more WaterBoy Well Buckets. Unfortunately, I don't feel like I have that kind of money to spare. So I decided to buy all the components needed to make six well buckets. I would have the components on hand, and if the crisis comes, the well buckets can be made at that time. It has been two months since I decided to do that, and I have gradually been buying the parts. I bought the last hardware I'll need a couple days ago. I'm not buying tripod parts or rope—those parts can be figured out by others when/if the time comes. Everything will be stashed up in the rafters of my shed, along with my tripod. And I have informed my son of this plan, just in case I'm not around. I have related all of this so you will consider your own plans to have drinking water in a long-term crisis. Water is more critically necessary than food. You don't want to be dependent on others for water. You don't want to be part of the problem. You want to be part of the solution. The WaterBoy Well Bucket is an excellent product that I am pleased to recommend. And I want to make it clear that I have not been compensated in any way for this product review. The July/August (#125) issue of Back Home magazine has an article entitled, "An Emergency Hand Pump." 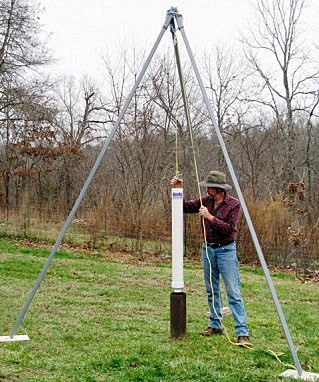 It uses a Pitcher Pump and adds a foot valve so the Pitcher Pump will work at a depth greater than 32 feet. The article is written by James S. Juczak. Interesting. That reminds me that I do have a pitcher pump that I bought for Y2k for the backhoe-dug well we had back then. It is only ten or twelve feet deep and would go dry in the summers if we did too much laundry (it also had snakes in it). That's good to know. Many drilled wells in these parts are deeper and do not have water as high as ours. Thanks for the information. I used to subscribe to Farmshow but have let it lapse. They featured a few of my Whizbang ideas in the past. Thanks for the info. We have been pondering what to do for water in a longer-ish outage. We have a creek but it is pretty far when you have to carry water and it is a "drain" from area farmland which leaves us questioning the safety of the water even after it is boiled and filtered. My well has a submersible pump in the bottom of the well... any experience removing these? I'm tempted to remove it just to learn how so I could use one of these, but I'm afraid I'd screw it up and be without water till a contractor could fix it (not to mention the associated costs!). Good idea. Just make sure you have the hardware (if necessary) to remove the submersible pump (like Clinton said) other wise you'll likely not be able to fit the well bucket down the casing. Mr. Kimball, without meaning to sound like Mr. Rogers, I'd like you to be my neighbor! People who are well prepared AND thinking about helping those around them are few and far between. I know why you can't use an ordinary bucket and rope to get water from a well (though I have done so from a 3' wide well with a shallow water table by throwing the bucket upside down), but perhaps not all your readers do. The bucket will float on the water and never get a drop inside. You could put enough rocks in the bucket to sink it, but it would take twice the effort for half the water. I have lifted a relatively short length of pipe with a pump on the bottom and it was years ago. It is technically simple (just unhook the electrical wires and lift the pipe up) but it can get difficult when the pump is way down. I wouldn't recommend that you do it unless you need to. But you can check out several YouTube videos on the subject to see how it's done.